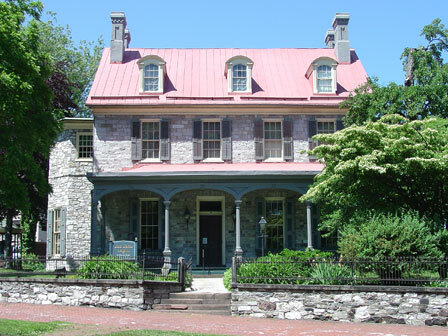 The John Harris-Simon Cameron House is one of the oldest homes in Harrisburg. The original house was built by John Harris, Sr., one of the first European immigrants to the area and an associate of William Penn. Penn had asked Harris to come help him build relations with the Native Americans and to facilitate the settlement of the central and western portions of Penn’s colony. Upon his arrival, Harris built his home on the riverbank to establish trade and communications with local tribes. Years later, he started to operate a ferry service and continued his business until his death in 1748. Following his death, the house was inherited by his son, John Harris, Jr., who decided to rebuild the house on a higher elevated area of the property to prevent periodic flooding. After the house was rebuilt, the property passed through multiple owners until its final owner, Elizabeth Wright, donated it to the Historical Society in 1941. Since then, the mansion has been home to the Historical Society of Dauphin County. The Mansion is now open for private and business events. Tours are also available on select days to the public by the Historical Society.